Neturei Karta members call for dismantling of Israel at anti-Zionist rally against AIPAC conference in Washington. Haredi radicals from the fringe Neturei Karta movement joined anti-Israel protesters rallying against the 2018 American Israel Public Affairs Committee conference in Washington DC Sunday afternoon to call for the dismantling of the State of Israel. Members of the anti-Zionist haredi group addressed a crowd of demonstrators, denouncing the State of Israel and beseeching God to “remove” the Jewish state. “We plead everyday with God, who is compassionate, to bring a speedy and peaceful dismantlement of this occupation in its entirety,” said Yisroel Dovid Weiss, a representative of Neturei Karta. Other Neturei Karta activists carried signs reading “Torah Demands: All PALESTINE be returned to Palestinian Sovereignty”. “It’s forbidden for us to steal or occupy – [the Zionists] have the audacity to hijack our identity for something that’s totally unacceptable,” Weiss said. Pro-Palestinian protesters also made explicit calls for the elimination of the State of Israel, chanting “From the river to the sea, Palestine will be free”. Demonstrators also called for the ‘liberation’ of Jerusalem and Haifa, chanting “Jerusalem will be free”, “Haifa will be free”. 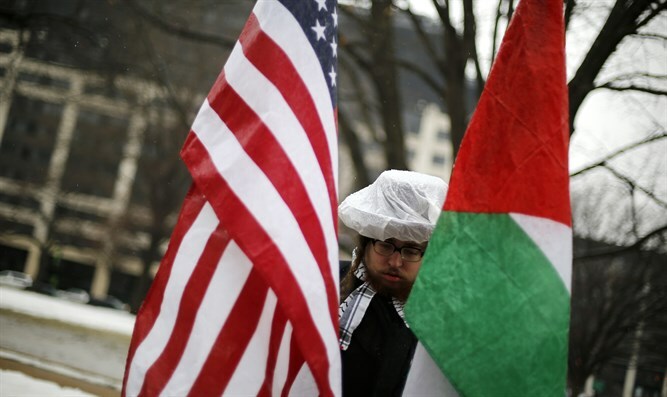 No arrests were reported at Sunday’s anti-AIPAC rally. Last year, however, anti-Zionist protesters clashed with pro-Israel demonstrators, and blocked one of the entrances to the AIPAC conference, leading to over a dozen arrests.